I've been craving for raw oysters since I ate it last year at Joe Fortes. Surely more than a year wait is too long! 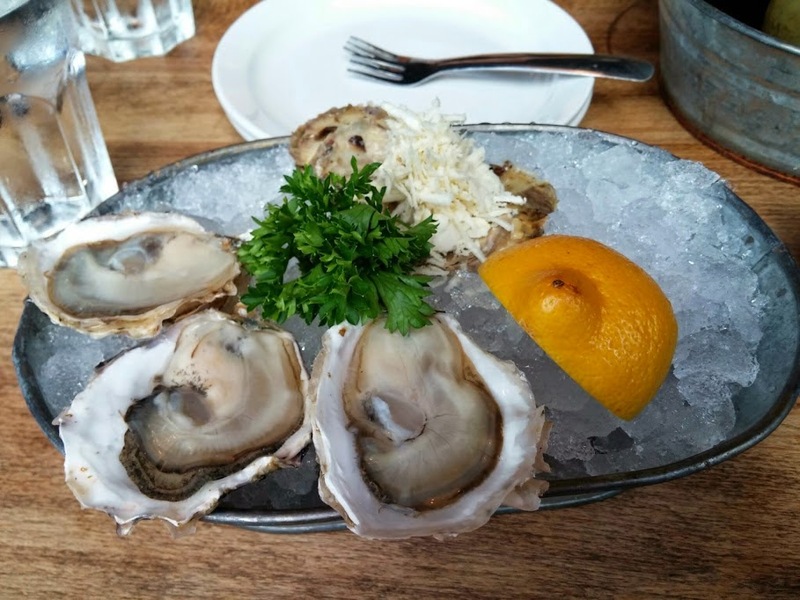 Chewies Steam and Oyster Bar has daily buck-a-shuck (aka $1 per oyster) from 3 to 6pm. We went around 4pm on a Friday and there were only a few tables. Online I read that the service can be spotty during happy hour but our server was very attentive and we didn't have any problems. The oysters for a buck that day were from Vancouver Island though I forgot the name. It came with horse radish and four house-made sauces that ranged in spiciness. Even the spiciest one wasn't that spicy to me though I enjoyed all the sauces with some made with red wine and others more vinegar based. The oysters were very fresh and well cleaned. During happy hour the appetizers, called first bites, are half-priced so we tried two. 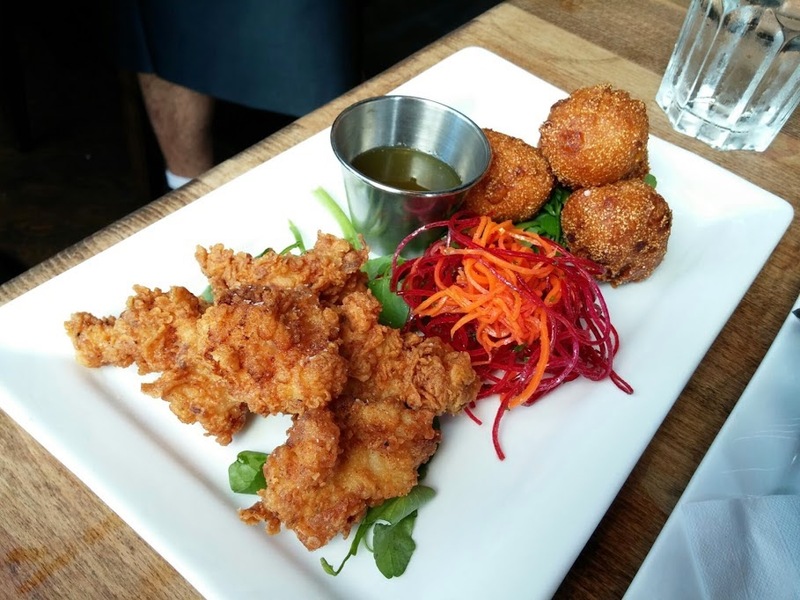 An appetizer name that stood out to us was Chicken Fried Gator and Hush Puppies. After asking the server, he confirmed that it was alligator meat deep fried like chicken and hush puppies are fried corn bread. The alligator meat was like a cross between fish and chicken, it was chewy but more moist than chicken. It came with jalapeno jelly to dip which wasn't that spicy. 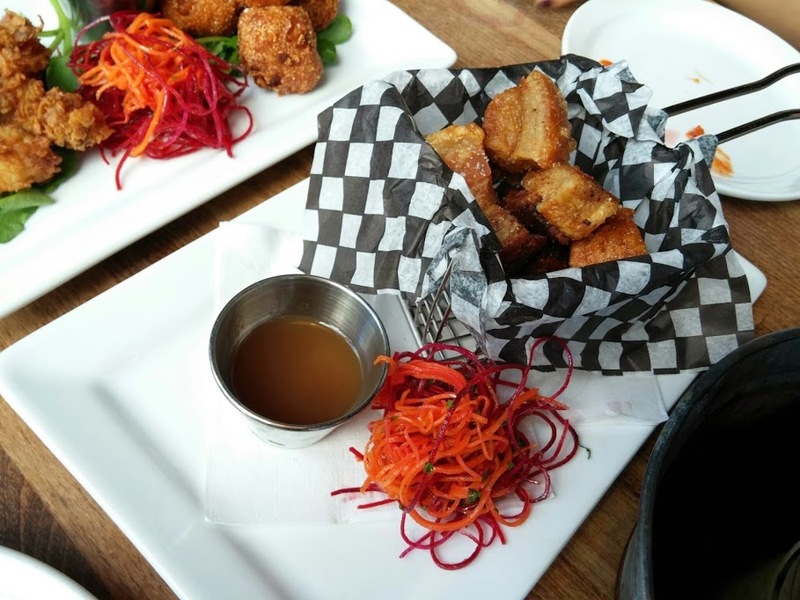 The other appetizer we got was the Pork Belly Cracklin' which reminded me of Chinese BBQ pork but thoroughly deep fried. The skin was crispy and the layers of fat and meat melted in the mouth. Though some pieces were tough because it was overly fried. I liked the Cajun sweet and sour apple sauce that came with it because the sourness made the pork belly a little less filling. Overall it was a great small meal at Chewies. Correction, small but very filling since it was mostly fried food. They're building an outdoor patio which I'm not sure will be finished by the end of this summer. If not I'd surely go visit it next summer.